Part of the reason for borrowing an all-electric car for three months instead of a week was to not only evaluate the practicality of living with it, but also to see how my feelings would develop. And, as I kind of expected, with my daily driving of a little light-blue Fiat 500e named Fidelio, I am getting attached. And why not? For driving to work, the car’s superb. Errands–excellent. I’ve traveled 15 miles to the vet, 20 to the hair stylist, 11 miles to the shopping center. My trip to work is 36 miles round trip. So, other than an occasional need to go further, I’m happy. Here’s how the day works. Because I charged Fidelio at work the day before, when I start him up at 7 a.m., he’s got 45-55 miles of range on the clock, without on the home charger overnight. That means he’s normally facing in toward the garage. If he’d been on the home charger, I’d have backed him in to get the charging socket closer. It’s on the right rear fender, where the gas filler is if you have an engine instead of a motor. I walk out my gate and there he is. What a cute little car. I’m glad I ordered the retro blue paint and white trim. I push the bottom button on the key fob and open the little hatchback. I place my briefcase back there on its side and close the lid. I pull out 5 dollars for the bridge toll, open the door, and slide in. He’s facing out below–must have been on the charger! Yes, I could use Fastrak and ride in the carpool lane, but this little test car isn’t mine and I don’t have the California stickers. It’s OK. The way to work is pretty much all downhill or level, so the range gauge–a digital display at the bottom of the large circle speedometer–barely changes for the first few miles. In fact, it’s sometimes higher at the bottom of the hill to my house than at the top. As always, the motor barely emits a sound–just a slight whine as you accelerate. That means that Sirius XM Satellite radio or FM–or Bluetooth streaming from my phone–is crisp and clear. The audio system in the Fiat 500e is pretty good, with woofers in the door and tweeters on the front windshield pillars. Fidelio flies along through traffic. It does start to get congested as we get closer to the approach to the San Mateo Bridge. But, unless I have an early appointment, I just relax. The white, black and chrome dash is very pleasant to the eye. I especially like the little blue crescent of door trim that’s at the corner where the door and the dash meet. Of course, you can’t see any of the outside of the car from inside, with the short, sloping hood and white, rather than blue, mirrors. Today, I noticed a dark gray 500e ahead of me. I hoped to catch the driver’s eye and wave to a fellow EV driver, but to no avail. I did get a dark gray Tesla launch itself into traffic a few minutes later, in front of me. He waved–probably to “thank” me for letting him cut in front of me. We finally get on to the bridge approach, and it slows to a crawl again. No problem. It means I’m charging the battery every time I touch the brake pedal, and I’m using nothing while I’m sitting immobile. Traffic opens up again near the tolls. I drive up to pay my money and always hope the toll taker will say, “Nice car,” or “Is that an electric car?” They never do.In fact, today’s guy literally let out a big yawn! I think that job must be one of the worst. Even the other electric drivers usually don’t seem to want to display the sense of shared coolness that I feel. I feel less like a journalist and more like a pioneer. There is a sense of being part of a secret society when you drive an all-electric car. So few of us are driving them now, but we’re right in the heart of traffic, with everyone else. Our cars look normal, especially if there’s a standard gas version available, like with the Fiat 500. But under the hood, they’re really different, and drive with a smooth, quick, silence that’s enjoyable and environmentally cleaner. Some day, we’ll be the norm. I feel a special sense of camaraderie with Fiat 500e drivers, and belong to a Fiat 500e Facebook group, but we really are more united by the kind of car we drive–and the decision that informed the acquisition–than by the brand. That doesn’t stop me from proudly wearing my FIAT cap, of course. My exit is approaching and I slow down to take the curve. I can see my office building now ahead, with our company’s name at the top. The six chargers stand at attention along the side as I approach, and I smile when I notice that most of the spaces are free. I back into one, wave my little card in front of the ChargePoint charger, plug in, and I’m off to work. So pleasant, despite the traffic. The fueling pattern is different with an electric car. I plug in every morning at work, five days a week, to top off the battery. It normally takes a little over two hours to charge. I usually receive a text message from ChargePoint in late morning telling me Fidelio appears to be full, so I run down and move him out so another EV driver can use the charger. 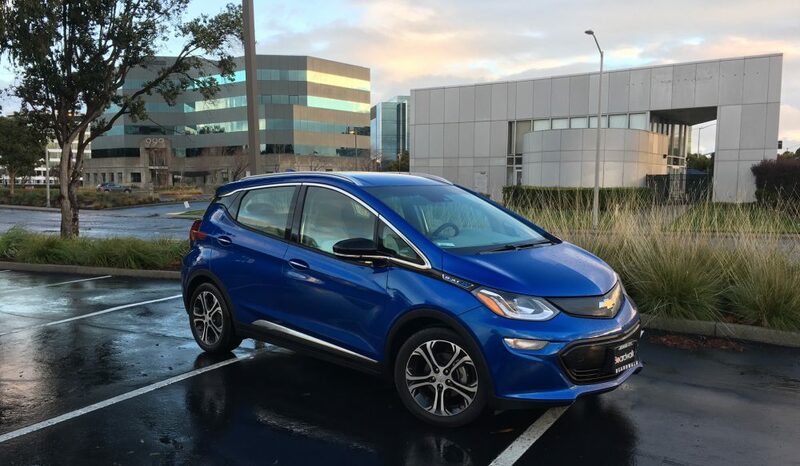 It’s EV etiquette–we have more than a dozen EV and plug-in drivers at my company sharing six spots. The thing is, with a gas Fiat 500, I’d probably drive through the gas station once a week and spend five minutes filling up. So, the amount of time I need to do something with my EV is minimal, but it’s spread out over the week, and takes advantage of times the car is just sitting there. It’s the same with home charging, except that for me as an EV borrower, not owner, I still don’t have Level 2 240-volt charging at home. So, it takes more like 11 hours to do what 2-1/2 hours will do at work. But the car is just sitting in the driveway, so who cares? I really like my blue baby. I may even love it. It’s cute, it’s comfortable, it’s nearly silent, and I feel good about cutting my emissions so much, so easily. I have carried my basses and my amplifier to gigs and rehearsals. The only issue that could come up is if I decide to play both kinds of bass at the same gig–or if the gig is 40 miles away. But I’ll work that one out. The other band members all have gas cars I can share. Meanwhile, it’s a pleasure to drive electric now. This entry was posted in cars, Electric car charging, electric cars, Fiat 500e, fuel efficiency, green cars, Uncategorized and tagged BEVs, carbon footprint, cars, climate change, Electric car charging, electric cars, electrics, Fiat 500e, fuel economy, global warming, green cars, hybrid cars, plug-in hybrid cars, plug-ins by stevegoesgreen. Bookmark the permalink.